Instantly reads temperatures with a high degree of accuracy. This waterproof digital thermometer is NSF certified and is small enough to fit in your pocket. Perfect for quickly checking the temperature in any cooking situation, from the grill to the stove top. Instant Read Meat Thermometer Features Include: Waterproof digital pen style thermometer, digital display, 10 minute auto shutoff, Thermistor sensors, ABS plastic anti-microbial additives, and reduced stainless steel tip for quick response time. 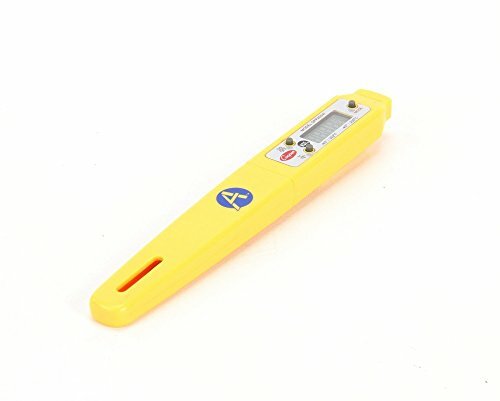 Waterproof Digital Thermometer Temperature Range: -40 to 392 degrees F (-40 to 200 degrees C) - Temperature Accuracy: +/-2 degrees F (1 degree C) from 14 - 212 degrees F (-10 to 100 degrees C), +/- 3 degrees F (1.5 degrees C) all other ranges - Thermometer Dimensions: 2.75" length, .75" tip, 0.046" diameter at sensor - Battery Type: 1.5v #LR44 battery - Weight: 0.9oz - Warranty: Lifetime About Cooper-Atkins Corporate Since their establishment in 1885, Cooper-Atkins has built a solid reputation as a leading manufacturer and provider of quality time, temperature and humidity instruments. The inventor of the first bimetal oven thermometer, David G. Cooper, founded The Cooper Oven Thermometer Company in 1885. The Cooper-Atkins Corporation takes extreme pride in their service levels and in customer relationships. These qualities have helped their business grow for 125 years. As a leading manufacturer of environmental and innovative food safety solutions, Cooper-Atkins has a global reach and is a trusted resource for reliable, high-quality instruments and expert advice. Instant Read Meat Thermometer - Ultra-fast response time, reads temperature in under 6 seconds. Accurate thermometer with easy to read digital display. Lifetime warranty. Waterproof Digital Thermometer - Perfect for grilling, bbq, indoor and outdoor cooking. Thermometer temperature range from -40 degrees to 392 degrees Fahrenheit. 10 Minute Auto Shutoff - Pen style thermometer with probe and Thermistor sensor. 10 minute auto shutoff digital display to conserve battery life. Food Safe Materials - NSF certified instant read meat thermometer. CE, RoHS and WEEE certified. IPX7 waterproof rated thermometer. Designed with anti-microbial additive to avoid bacteria growth. Cooper-Atkins Corporation - Headquartered in Middlefield, CT, Cooper-Atkins has been a leading manufacturer of quality time, temperature, and humidity instruments serving the Foodservice, HVAC and Healthcare markets since 1885.